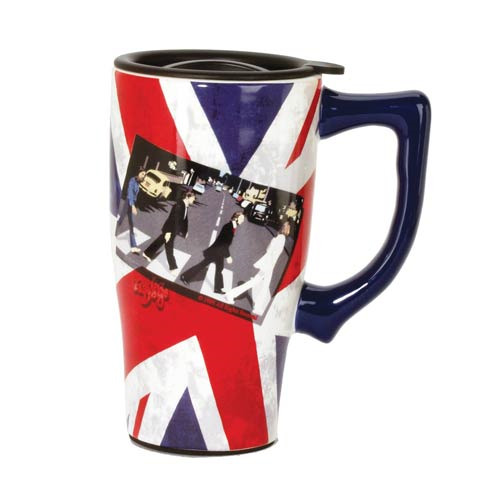 A double walled ceramic mug, it's The Beatles Abbey Road Union Jack Travel Mug with Handle! The mug holds up to 14 ounces of liquid. The Beatles Abbey Road Union Jack Travel Mug with Handle fits in most vehicle cup holders and is both microwave and dishwasher safe. The mug features the iconic cover of The Beatles' album Abbey Road with John Lennon, George Harrison, Paul McCartney, and Ringo Starr.